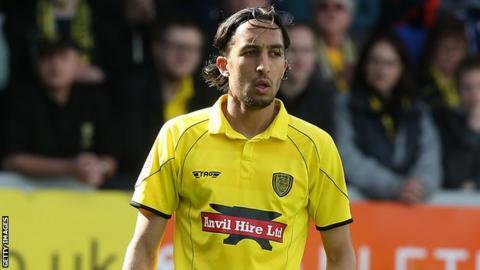 Late strikes from Tom Naylor and Nasser El Khayati ended Burton's three-game goal drought as they beat Port Vale at the Pirelli Stadium in a game in which both teams were reduced to 10 men. Vale's on-loan striker Uche Ikpeazu received a second yellow card halfway though the first period for diving. Robbie Weir was then shown a straight red for a foul 10 minutes from time, just before Naylor fired Burton ahead. El Khayati secured victory, finishing a fine solo run to slot past Jak Alnwick. Vale, who have slipped to 17th after four league games without a win, also had four other players booked in an ill-tempered game of six yellow cards and two reds. Jimmy Floyd Hasselbaink's promotion-chasing Burton remain third, just two points off top spot, following their first win in four matches. "I must say, we deserved it. We were the better team. They made it very difficult for us and it is all respect to the boys for what they have done. "We will see more teams coming here, trying to upset us, trying to shut up shop, not to give nothing away. We have to find a way to break them down. It took a while but we found the net and it was important for morale. "I've no complaints about the red cards. The only thing I didn't understand in the first half was the yellow for their striker. When you see an elbow it's a straight red." "You give a performance like that, when they're throwing their bodies on the line in defence and do what they've done for a large part of the game with 10 men, it's harsh to come away with a 2-0 defeat. "It's a big ask for anybody. They've given me everything. They had to work their socks off. The fans were superb. They really got behind the lads. They could see and appreciate the work the lads put in. "We're all frustrated, but it's important we all stick together and get through this tough spell. We can't feel sorry for ourselves now. Only we can change it." Match ends, Burton Albion 2, Port Vale 0. Second Half ends, Burton Albion 2, Port Vale 0. Richard Duffy (Port Vale) wins a free kick on the right wing. Corner, Burton Albion. Conceded by Carl Dickinson. Goal! Burton Albion 2, Port Vale 0. Abdenasser El Khayati (Burton Albion) right footed shot from the left side of the six yard box to the centre of the goal. Assisted by Zeli Ismail. Corner, Port Vale. Conceded by John Mousinho. Substitution, Port Vale. A-Jay Leitch-Smith replaces Michael O'Connor. Michael O'Connor (Port Vale) is shown the yellow card for a bad foul. Abdenasser El Khayati (Burton Albion) wins a free kick in the attacking half. Substitution, Port Vale. Ryan Lloyd replaces Sam Foley. Goal! Burton Albion 1, Port Vale 0. Tom Naylor (Burton Albion) header from the centre of the box to the bottom right corner. Assisted by Zeli Ismail. Corner, Burton Albion. Conceded by Ryan McGivern. Attempt blocked. Abdenasser El Khayati (Burton Albion) right footed shot from the centre of the box is blocked. Attempt saved. John Mousinho (Burton Albion) right footed shot from the left side of the six yard box is saved in the bottom right corner. Substitution, Burton Albion. Callum Butcher replaces Mark Duffy. Corner, Port Vale. Conceded by Mark Duffy. Robbie Weir (Burton Albion) is shown the red card. Substitution, Port Vale. JJ Hooper replaces Colin Daniel. Attempt missed. Robbie Weir (Burton Albion) right footed shot from outside the box is close, but misses to the left. Attempt missed. Timmy Thiele (Burton Albion) right footed shot from the centre of the box is close, but misses to the right. Substitution, Burton Albion. Aurélien Joachim replaces Philip Edwards. Attempt missed. Timmy Thiele (Burton Albion) right footed shot from outside the box is close, but misses to the right. Corner, Burton Albion. Conceded by Jak Alnwick. Attempt saved. Mark Duffy (Burton Albion) right footed shot from outside the box is saved in the top centre of the goal. Attempt missed. Tom Naylor (Burton Albion) header from the centre of the box is close, but misses to the right following a corner.